Pureplays address social business as transformation by definition because they have been launched to address emerging market needs that established players either do not yet understand or have yet to organize to address. Moreover, Pureplays are not adding social business to their existing services; they have been formed to practice social business. They are a small cohort in this research survey because they were constrained to social business and transformation as were advisory firms in other categories. Pureplay firms are often smallish startups, so they are quite limited in some areas when compared to established legacy firms as in this research survey. From a market and client perspective, Pureplays represent a vital part of the market and can offer unique capabilities; however, clients need to approach them with “eyes wide open” because the way they serve clients varies considerably. 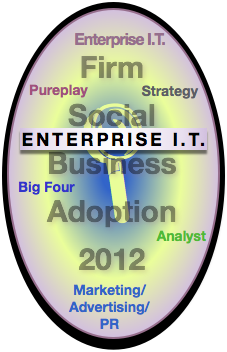 [UPDATED] Enterprise I.T. vendors are chiefly product businesses that specialize in large-scale “solutions,” and all contenders in this research survey field large services businesses. They are a diverse group that was selected based on their public activity relevant to social business transformation. For example, Salesforce.com is a leading cloud infrastructure and services provider that sells organizational flexibility, which synergizes with social. IBM, Dell and Hitachi are large product vendors, although IBM’s services business is now larger than its product divisions. Accenture, Infosys, Capgemini, TCS and Cognizant are large outsourcing providers, although Accenture’s roots are management consulting, and it subsequently developed a large outsourcing business. BearingPoint is regrouping after bankruptcy; its origin, like Accenture’s, was an audit firm spinoff (KPMG and Andersen respectively). [UPDATED] The Big Four accountancies have been rebuilding their advisory practices for the past several years, and social business transformation fits with their core competencies in important ways. Like Strategy firms, they have been watching adoption and producing thought leadership on various aspects of social technologies’ relevance to business. Their approach also resembles that of strategy firms in that they have relatively low evidence of social business practice. Big Four firms are well positioned to evolve into social business consultancies because they have core competencies in business strategy and business process transformation. However, they will be challenged by their relative lack of core communications skills and awareness of “soft” social, people and behavioral knowledge. Deloitte has been an early adopter of social business as a concept, perhaps because it did not shed its consulting practice in the early 2000s as all others did. PwC acquired boutique social business consultancy Ant’s Eye View in 2012, which shows its intention to integrate social business more deeply into its Customer Impact practice. [UPDATED] Analyst firms are go-to sources for emerging business and technology trends since they conduct constant due diligence on markets and technologies, which they sell via a subscription model. In addition, they are prodigious producers of content, conferences and other thought leadership activities relevant to social technologies, and a large portion of their employees produce and deliver content publicly (research, write, present), which strengthens their competency with social technologies. As with most advisory firm categories, market leaders Forrester, Gartner and IDC are being challenged by analyst social business pureplays Altimeter Group and Constellation Research Group, while other firms hang back. This report also includes NM Incite, which is more of a market search firm, but it makes for an interesting comparison. 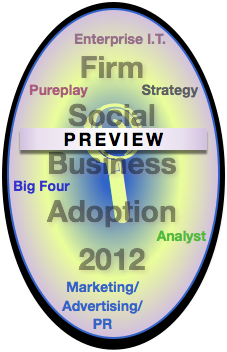 Advisory and Services Firm Social Business Adoption 2012 is publishing as individual Executive Summaries of firm category reports. These discuss relative scores of firms in each category, but they don’t disclose scores themselves. This enables us to have some fun. You can guess the highest scores in several categories and win valuable prizes! To be eligible for 1st, 2nd or 3rd prizes, all you need do is respond to four questions via the embedded survey below. You could win an Extended Analysis report of any firm in this Research Survey, or even commission your own Extended Analysis report! For five minutes of your time. 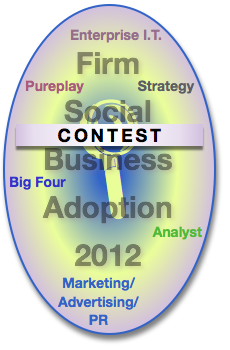 I will award prizes two days after the last Executive Summary publishes (see the Research Survey microsite for dates). However, the first person who responds with the correct answer wins that prize. This introduces some risk for people who just wait until the end! You should also know that I reserve the right to change any of the rules or prizes without notice except on this page. Advisory and Services Firm Social Business Adoption 2012 audits the maturity of management consultancies’ and agencies’ social business practices. It aims to serve CEOs and CMOs who want to maximize the potential value of social business by evolving their organizations. 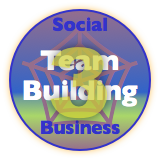 Similarly, it will be useful to firm and agency executives that want to position themselves as strong players in the growing market for social business strategy. This research survey may be unique because it focuses its evaluation on firms’ ability to advise clients on becoming more social by transforming their organizations. It attempts to factor out “social media promotion” since it is usually driven by marketing, not relationship. In addition, this survey quantitatively measures firms’ social business commitment; firms that don’t practice social business themselves cannot be credible advisors. The Advisory and Services Firm Social Business Adoption 2012 microsite has all information pertaining to the research survey.